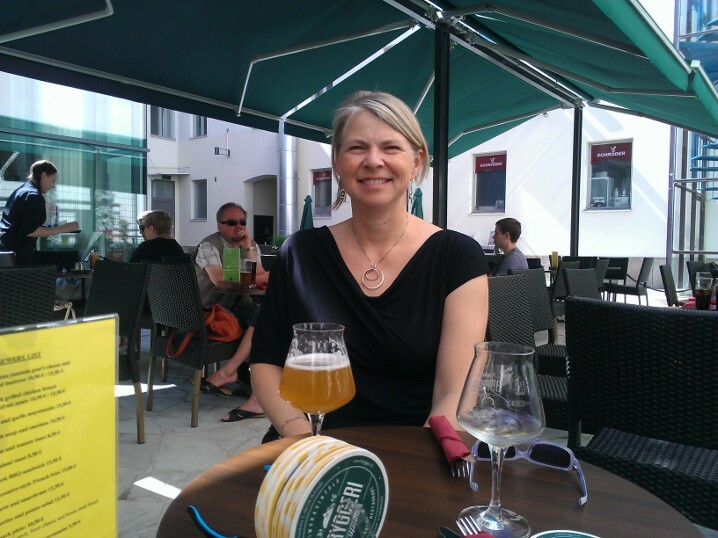 A few years ago, one of my retired graduate school mentors dropped me a line after his first-ever trip to Finland. He saw many people that resembled me, which he explained as persistent evidence of inbreeding in a still relatively insular society. (I was amused by this characteristic observation from a confirmed sociobiologist). On my recent trip to Finland after two years in southern France where people seem shorter and smaller and have more dramatic coloring, I did feel like my blonde hair, pale skin, and height were just about average. In my own sociological view though, what really stood out for me on my visit was how globally diverse Finland has become, and how easily English rolled off people's tongues. I was thrilled to discover so many people of foreign origins speaking Finnish fluently. There was the man of Chinese, or perhaps Korean origin, who sold me a hat at the flea market in Naantali; his Finnish had a lovely inflection as did the Helsinki bus driver's, whose native tongue was probably Arabic. At the airport, the young grocery store cashier with the dark, perhaps African complexion seemed to have absolutely no accent that I could detect, nor did the airline agent of Somali or north-central African origin. Aside from a course I took many years ago in Helsinki with other young students from mostly Europe, I have never before heard fluent Finnish spoken by such a diverse group of people. In the past, it was my accent or inflections that puzzled Finns who couldn't quite place my origins. Today, many more immigrants have come to Finland from beyond Europe, settling in to work and learn the language of their new country. I was also pleasantly surprised by the ease with which young Finns slip between English and Finnish. When I was younger, just the shop clerks at the big department stores and flight crews spoke English comfortably, but now, museum ticket-takers, waiters, ice cream stand sellers, apartment managers, all effortlessly switched to English when my husband was talking, and then switched back to Finnish when I spoke up. Today, English is the first foreign language that Finnish schoolchildren take in school, and it is then followed by, instead of preceded by, the second national language, Swedish. This, along with the ubiquitous English-language television programming which is subtitled but not dubbed as it is in France, means that Finns are broadly exposed to English. It is after all the official language of the EU. Yet it doesn't appear that Finnish is disappearing by any means, as it clearly remains important for the immigrants who make Finland their home. As with many languages, external influences are enhancing how the Finnish vocabulary develops. In a short article in a Finnish women's magazine, the chairperson of the Left-Wing Youth used many Anglicisms: would people get the 'pointi', if women 'sheivaa' or not their body hair? ("Antaa Rehottaa", Me Naiset, 1.8.2013, nro. 31, p. 16). Finally, we also observed that the foreign culinary influence in Finland has widened, as we discovered jalapeños on our hamburgers and pizzas! 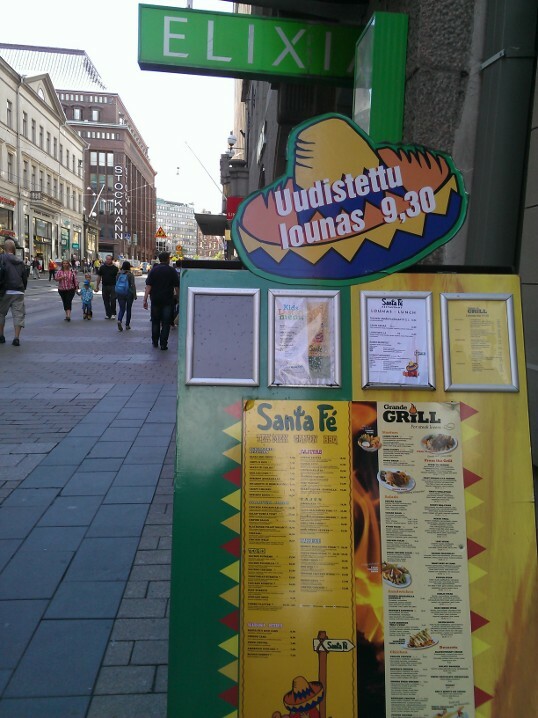 Subsequently, we noticed the proliferation of Mexican-influenced restaurants in Helsinki. While we enjoyed eating certain uniquely Finnish foods (the meat pies, the rice pasties, Fazer chocolates and candies), we did appreciate the flavor enhancements brought about by globalization. Apparently, so do other Finns. In a newspaper interview comparing the values of Finnish elites and ordinary people (that I happened to catch a glimpse of at the Cafe Strindberg on my second to last day in Helsinki, "Homoliitto erotti eliitti-Benin ja kansa-Karon" by Hannu Tikkala, 4.8.2013, Helsingin Sanomat), the Finnish guy representing the point of view of ordinary Finns pointed out that having international workers and people in Finland means that Finland gets better food...and better-looking people. While I don't know about the latter, there are clearly benefits associated with the global movement of people, languages, and traditions. This is so interesting, Anne, and takes me back to my own sociology days! Norway used to be the gold standard in demographic circles for a country with an awesome population registry (keeping track of each citizen), but I have wondered how that might work with increasing immigration. Thanks for a fascinating and thought-provoking post!